Served with a Kiva's Hand Rolled Bagel. Egg Whites, No Extra Charge! Feta, tomatoes, peppers & onions. Mushroom, tomato, green pepper & onions. Spinach, basil, parsley & green onion. With challah croutons & parmesan. With chopped veggies and lettuce. Romaine lettuce, tuna, mixed peppers, mushrooms, peas, carrots, celery, crispy noodles & sesame seeds Asian sesame dressing. Iceberg & romaine lettuce, avocado organic cheddar, grape tomatoes, kidney beans, black beans, corn & red onion, sweet onion vinaigrette dressing. Romaine lettuce, roasted red peppers, sundried tomatoes, feta, artichoke hearts, cucumber & kalamata olives. Kiva's own Greek dressing. Romaine lettuce, cherry tomatoes, corn, avocado, roasted chicken & blue cheese. Low-fat ranch dressing. Download your online order form. Call us for the soup of the day. Apples, carrots, celery, light mayo. Roasted chicken breast, pesto, and provolone. Fat free organic yogurt, crunchy granola & mixed fresh fruit. Can be served buffet style with bowls. Premium hand trimmed Nova Lox and scoops of Light Cream Cheese Garnished with Tomatoes and Cucumber, Red Onions and Capers. 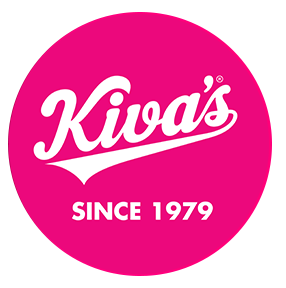 Includes plenty of Kiva's own bagels. Hand trimmed Atlantic?Smoked Salmon garnished with capers and onions. Assortment of fine cheese: Medium cheddar, Swiss, Gouda, Havarti, Provolone and Lappi. Includes plenty of Kiva's own bagels. Enjoy a delightful selection of market fresh seasonal fruit. Fresh cut veggies with Kiva's own veggie dip! A delicious assortment of our homemade Danishes , Rugelah, chocolate & cinnamon Bubka, gourmet cookies, squares, tarts, Garnished with fresh strawberries. An assortment of sandwiches including: Salmon, Chopped Egg, Tuna, Cream Cheese, Cream Cheese and Chives & sliced Cheese Sandwiches. All garnished with fresh cut veggies. An assortment of sandwiches including: roast turkey, roast chicken breast, chicken salad, roast beef and spicy salami, garnished with fresh cut veggies. A delicious assortment of our homemade Danishes, Rugelah, chocolate & cinnamon Bubka, gourmet cookies, squares, tarts, Garnished with fresh strawberries.